Lt. Col. (Ret.) Amy McGrath celebrated after Tuesday's primary win. 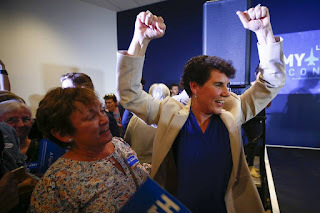 The victory of former Marine fighter pilot Amy McGrath in Tuesday's Democratic primary in Kentucky's 6th Congressional District was based in part on a strategy of appealing to rural voters, especially through rural newspapers. That was the idea of campaign manager Mark Nickolas, who had quit political work more than a decade ago and "had never worked in a campaign in the digital era," reports Michael Tackett of The New York Times. 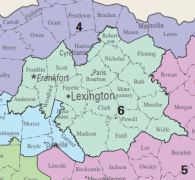 With the Democratic Congressional Campaign Committee pushing Lexington Mayor Jim Gray to get into the race, Nickolas "saw the Washington rebuke as an opportunity to run the campaign his way, without having to hew to the DCCC playbook. That meant buying ad space in small-town newspapers for opinion pieces by Ms. McGrath, buying billboard space, and building a field operation in rural areas where few Democrats have dared to even campaign in recent years." McGrath had plenty of money from outside Kentucky, thanks to an announcement video that went viral, but she also sought out interviews with weekly editors like Ben Carlson of The Anderson News, who complimented her in a column and then did a long story about her. Carlson told Waldron, “I haven’t sensed, in a congressional race, this kind of enthusiasm for a candidate in the 12 years I’ve been running the paper. For either party. She’s brought that kind of excitement to it.” McGrath won the county by more than 2-1 over Gray and got 61 percent of its vote, her highest county share. The primary had four other Democrats seeking the nomination to face three-term Republican Rep. Andy Barr. She carried every county but Fayette, Gray's base, and won 49-41. "Still, for much of the race, the DCCC seemed to have made the right calculation," Tackett reports. "In March, a survey for Mr. Gray, which his campaign released in April, showed he was up by 25 points with a little more than a month left in the race. It was sobering — but [McGrath] was campaigning aggressively in rural areas, and followed through on her plan to stay positive. . . . Nickolas continued his quirky tactical moves, which included making yard signs for individual counties, and one for rural areas in Marine red rather than Democratic blue." In the time between Gray's poll was taken and released, McGrath was catching up to him, breaking into the lead in mid-April. Waldron reports, "In a direct appeal to the rural parts of the district, she’s advocated for an expansive role for the federal government, arguing that it should invest heavily in broadband, infrastructure, and job and economic development in areas left behind by the decline of manufacturing and the collapse of the coal industry," which has a very small footprint in the district but many transplants from the Central Applachian coalfield. McGrath's win sets up "a November election that will attract national money and attention as Democrats try to make Kentucky part of a possible blue wave in 2018," Daniel Desrochers, Lesley Clark and John Cheves wrote for the Lexington Herald-Leader in Lexington. They called her a "candidate who fits the Democratic moment . . . a political newcomer at a time Democrats across the country are looking for a fresh response to the 2016 election of President Donald Trump."